The importance of meal timing is nicely illustrated by the well-known parental advice to “eat your breakfast; it’s the most important meal of the day”. Lately this parental advice is getting more and more scientific support, as recently it has been shown that skipping breakfast is associated with an array of unhealthful outcomes, including body weight gain, overweight and obesity. The mechanism for these unfavorable outcomes is far from clear. Therefore, we will investigate how feeding behavior, i.e. timing, light conditions, frequency, size and composition of meals, affects daily oscillations in glucose tolerance, lipid metabolism, insulin resistance and energy expenditure (EE), i.e. the main players in the development of obesity and type 2 diabetes mellitus. In addition, several studies in experimental animals have shown that eating at the wrong time of the sleep/wake cycle, i.e., during the sleep phase, favors the development of obesity. In recent years it has become clear that the orexin system in the lateral hypothalamus is an important output pathway for the central biological clock, with pronounced effects on the sleep/wake-rhythm. Orexin is thought to be one of the main arousal systems in the brain, i.e., narcoleptic patients have a lack of orexin. CSF orexin levels show a pronounced day/night rhythm with peak levels being found during the active phase, both in nocturnal and diurnal species. In addition, as indicated by its name, orexin also stimulates appetite and our own experiments have shown that orexin stimulates hepatic glucose production via the autonomic nervous system. The current project aims to test the hypothesis that a disturbed day/night rhythmicity of the hypothalamic orexin system is responsible for the deleterious effects of “eating at the wrong time of day” on glucose metabolism and adiposity. Our experiments should reveal whether indeed “eating at the wrong time of day” results in a shift or a disturbance of the normal day/night rhythm of the hypothalamic orexin system. Subsequently the functional significance of these changes in orexin release will be investigated by either local or intracerebroventricular administration of orexin-antagonists. 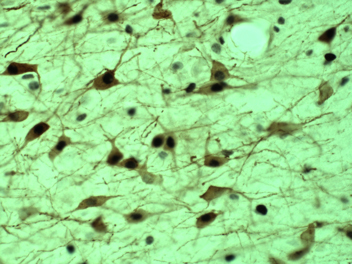 Neurons expressing the orexin peptide are marked by a brown colour. Neurons activated by blocking the inhibitory GABAergic input to the lateral hypothalamus are marked by the black nuclear staining.